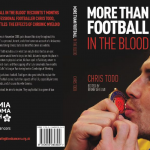 Chris Todd book signing on Saturday | Salisbury City FC "The Whites"
Ex-Whites player Chris Todd will be making an appearance at the Ray Mac on Saturday to sign copies of his new book, “More than football in the blood”. Chris was diagnosed with leukaemia in 2008, and managed to overcome it and enter remission. He joined the Whites on loan in order to regain match fitness, and after a successful stint at Torquay, had another spell at the Whites. He has written and published a book by himself in order to raise awareness of the disease, and to make money for leukaemia and lymphoma research. The book is priced at £6.99. The Whites take on Eastbourne Borough at the weekend, after a Tuesday evening bout against Basingstoke Town.